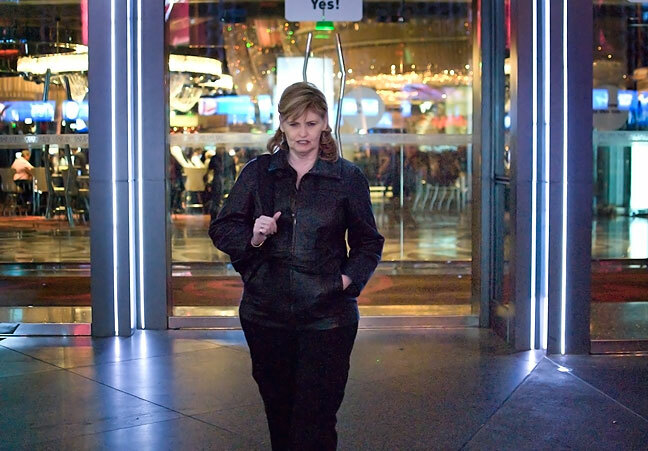 Abby watches the lights in the heart of the Las Vegas Strip. The beautiful Las Vegas Strip viewed from our balcony shows the famous Bellagio Fountains. Abby crochets an afghan for our grandson while Sierra the Chihuahua sleeps in her lap as we drive from one venue to the next. Abby and I got off to a very late start, but once we were on the road we travelled well and had a great time. Abby had been sick for ten days before we departed, but as the sun came up and we headed west, she seemed to feel amazingly better and happier than I’ve seen her since she caught the crud. The dogs were happy to be huddled on their blanket in the back seat of Abby’s truck. As we crossed into New Mexico under the perfect desert sun, we both started getting text messages about severe thunderstorms moving though Ada. By the time we pulled into Santa Fe, our home in Oklahoma had received 1.24 inches of rain. As has become our tradition, we got Chinese food delivered for dinner. We have always gotten great Chinese food in Santa Fe. This is one of Abby’s images of a dance group who performed on The Plaza in Sante Fe. 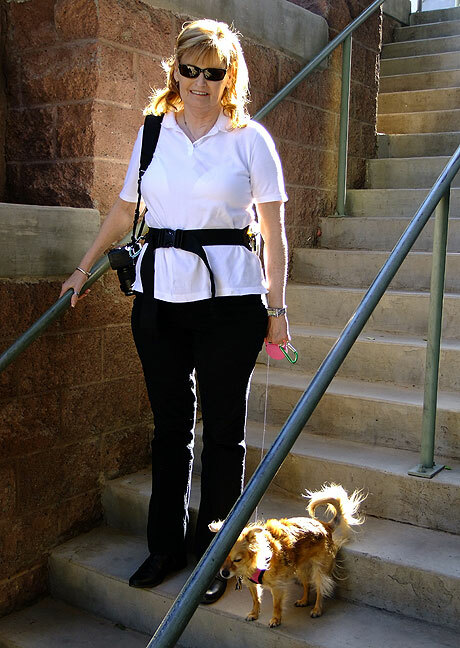 This is me on The Plaza in Santa Fe after I sat on a curb to take the dogs’ sweaters off after it started to warm up. Abby on The Plaza in Santa Fe. The morning was cold and clear in Santa Fe. We walked around the plaza and found a few souvenirs. We made some nice images. As Abby said, “The dogs were the superstars,” with about every third person admiring them and wanting to pet them. The peak moment was when about six teenagers showed up with a boom box and set up in the pavilion. They performed about five really energetic, fun, clean dance sets, including hip-hop and break dancing. The crowd, which had really started to fill out, got into it, and everyone had a great time. Abundant autumn sunshine followed us for the entire trip, like in this image from Santa Fe. An artist waits to sell paintings, Santa Fe, New Mexico. Abby made this image of a flute player’s hands. I made images of this same musician in April. Abby made this image of Sierra the Chihuahua in a mirror at a shop in Santa Fe where we ended up buying a ceramic Chihuahua. Abby listens as a painter discusses his art in Santa Fe. A man moves a sculpture, wrapped in bubble wrap, down a Santa Fe street. When I first saw it, I thought it was an Apollo astronaut. Clay pots for sale sit in the chilly morning air in Santa Fe. Abby photographed this beautiful glass sculpture at a shop in Santa Fe. Ceramic sun symbols shine in the morning sunshine in Santa Fe. Laguna Pueblo, New Mexico viewed from the I-40 scenic view turnout; Abby and I considered stopping here to photograph the mission church as I did in 2000, but there are now signs at the entrance to the town specifically forbidding photography. Our drive to Flagstaff was sunny and easy. At sunset we stopped on the Interstate near Holbrook, Arizona to photograph the Cholla Power Plant. The Cholla Power Plant, a coal-fired facility, glows at last light near Holbrook, Arizona. 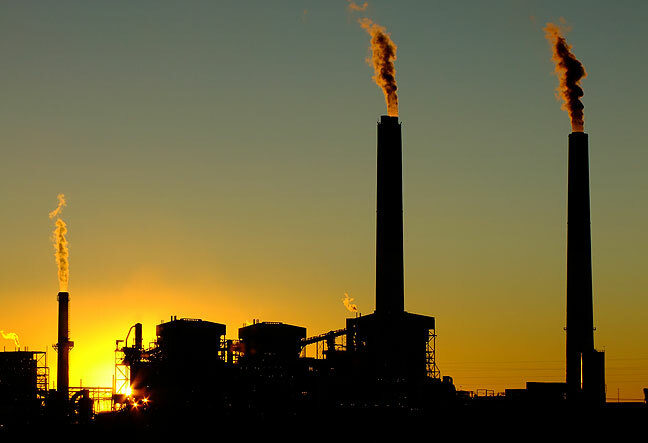 The exhaust stack at the Cholla Power Plant near Holbrook, Arizona, glows with light from the last of the setting sun. Cholla Power Plant, Holbrook, Arizona; this facility burns coal from a mine in New Mexico. Aspen leaves, morning, Flagstaff, Arizona. 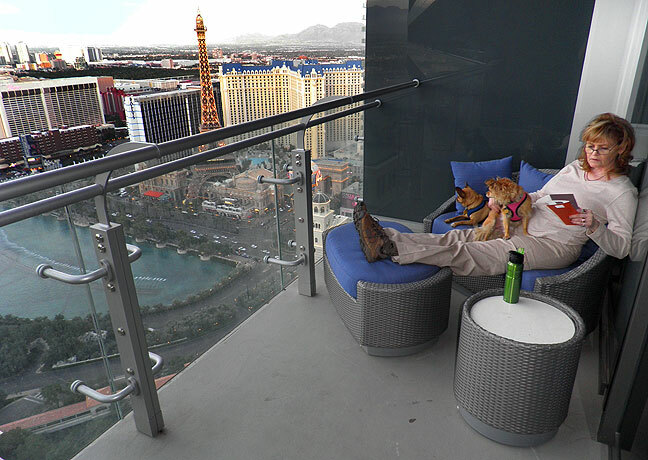 Abby reads the room service menu on our balcony as she and the dogs settle in to our 48th floor accommodations. The morning was clear and cold in Flagstaff, and Abby and I were in excellent spirits. We arrived in Las Vegas Monday afternoon and found our hotel, The Cosmopolitan, without difficulty. It is brand new, having opened in December, and is in the very heart of The Strip. Upon checking in, we were treated to a complimentary room upgrade to a terrance view room on the 48th floor, which sports a view of the City to the north, and is directly above the famous Bellagio Fountains. The room is huge and amazingly luxurious. Our room at The Cosmopolitan in Las Vegas was one of the most luxurious Abby and I have ever enjoyed. Captivating, exciting, energetic, entertaining: this was our view of Las Vegas. Abby and I went out onto the open air balcony with our cameras and immediately started shooting and watching, and didn’t say a word to each other for an hour. We had an excellent dinner at China Poblano here at The Cosmopolitan. Back at the room, Abby was tired, so I left her and the dogs to settle in while I walked the streets for a couple of hours. I didn’t go more than half a mile in any direction, and I never got bored. I saw tons of tourists of all descriptions, and as the night got later, more and more of them appeared drunk. I also saw some street performers, and at least two drunk panhandlers. This view from a skywalk looks north up Las Vegas Boulevard. The famous Bellagio Fountains perform their song and dance routine to a rotation of 30 songs at 15-minute intervals. As my stroll progressed, I moved north, ending up at the Bellagio Fountains, where the crowds were thickest. 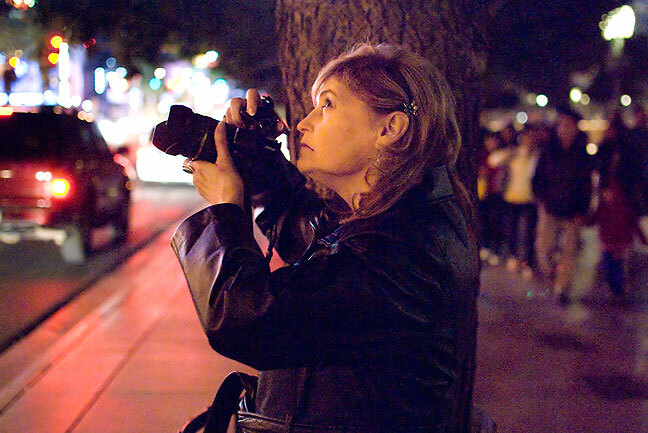 I photographed the Fountain show and people watching it, and other interesting tidbits. I feel like photographs I saw of Las Vegas before coming here did not express its energy in a way that gave me a taste of the actual experience, and I would like for some of my images to do that. Note: the notion that everything is cheap in Las Vegas so you’ll gamble is a myth. Lodging is fairly inexpensive, but everything connected to lodging, from the $15 internet service to the $68 apiece evening meal is all quite high. Bill’s Gamblin’ Hall; in a previous incarnation it was The Barbary Coast, and was visited by the World’s Greatest Siamese Pickle. This is the man who thought I looked mad; really I was just concentrating. Abby took the morning off and slept in with the dogs, while I decided to walk south on The Strip and see what might make pictures. I crossed the street on the skywalk into an area that had lots of small shops and attractions, some sleazy, some not. It made some interesting images. I crossed the street at the New York New York and made my way back north through the labyrinth of skywalks and ramps into City Center, then back to our hotel. All told it was about two hours, and I had fun. Neither Abby nor I had ever ordered room service, so I ordered her a turkey club sandwich, which she reported as delicious. This cacophony of advertising and sexuality is at the heart of the Las Vegas milieu. I thought some of the newer skywalks were elegant and beautiful. This is the same spot as the previous image, shot about six hours later. 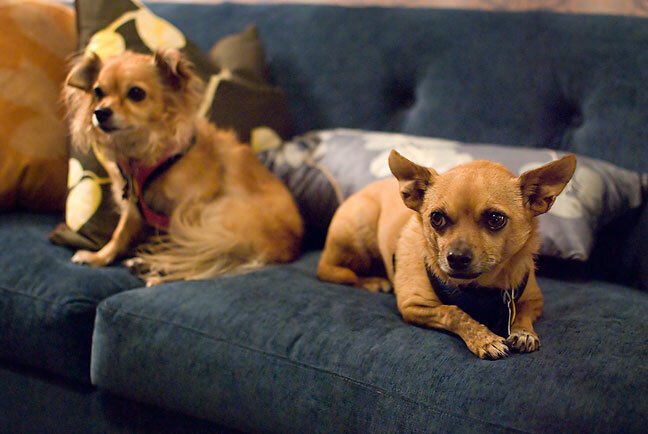 Once back at the hotel, Sierra and Max were very happy to see us and even happier to make themselves comfortable on the couch. I had not realized until I read today on the internet that The Strip is not in the City of Las Vegas. 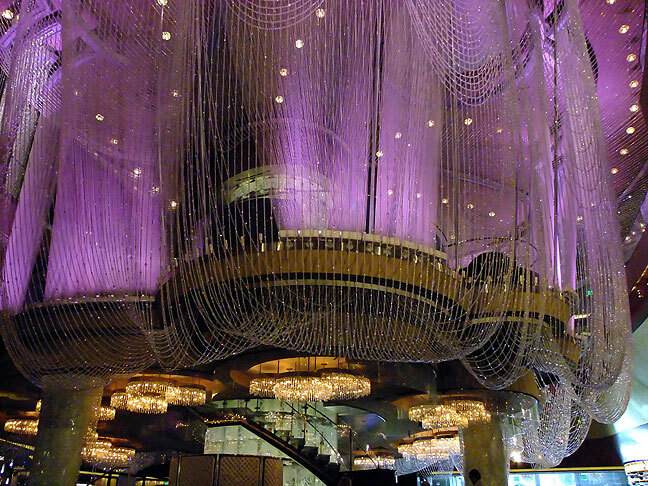 This is a bar at The Cosmopolitan called The Chandelier. 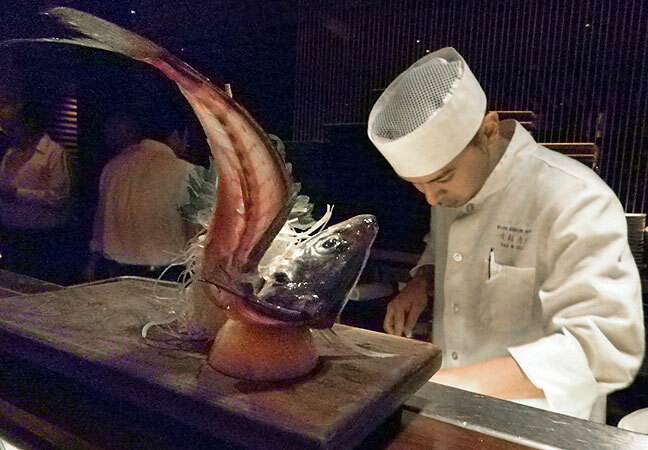 My sushi was vegetarian, but I thought this item on the sushi bar looked amazing. I confess that I would have no idea how to go about eating it. Abby had leftover turkey club from lunch for dinner, so I went to the sushi bar (she doesn’t like sushi anyway) and got their vegetable sushi plate, which was incredibly good. Afterwards I went walking one more time, this time all the way to the Luxor, the hotel that looks like a giant pyramid. Again, everywhere I turned seemed to make pictures. I though this escalator at The Cosmopolitan fascinatingly beautiful. Another image of Abby on The Strip shows the front door to our hotel, which we had little occasion to use. A visitor uses a smartphone to photograph the Bellagio Fountains. This view of the Bellagio Fountains was made from our balcony. Abby watches a performance of the Bellagio Fountains. Visitors line the wall around the 11-acre pond to watch a performance of the Bellagio Fountains. This classic view of the Fountains shows the Bellagio Hotel with its changing-color lights. A trumpeter statue at Caesars Palace on the Las Vegas Strip gleams in late afternoon sunshine. Buildings and sky shine on the reflective panels of The Hamon, a hotel at City Center in Las Vegas. The quarter-billion dollar structure was never occupied, and because of construction deficits is slated to be demolished. The Rio Hotel and Casino is reflected in mirrored sufaces of The Cosmopolitan, Las Vegas. This view of Las Vegas looks south toward The Aria, The Monta Carlo, and The Luxor. These two Elvis’s (Elvi?) try to drum up money on The Las Vegas Strip. Ten-second timed exposure of Las Vegas Boulevard; since my tripod was too short for my camera to see over the glass walls of the skywalk, I jammed it into a handrail and held it tight against the edge of the skywalk. Sculpture, City Center, Las Vegas. Pedestrians use an escalator from a skywalk near Bally’s on The Las Vegas Strip. This eight-second timed exposure looks southeast from City Center, Las Vegas. Planet Hollywood and The Paris Las Vegas combine to form this bright composition on The Las Vegas Strip. The Paris Las Vegas and Bally’s combine in this colorful rendition from 48 floors up. This view from above shows the entrance to The Bellagio as well as the two-thirds size Arc de Triomphe and the Montgolfier balloon at Paris Las Vegas. This telephoto view of Las Vegas shows rooftops of some of the best-known casinos. A worker uses a boat to inspect the Bellagio Fountains prior to their evening performance. The crown of the Bellagio Hotel is set against the Quartzite Mountains at dusk. The elegant lines of The Aria Hotel are an interesting contrast to the sometimes garish look of Las Vegas. Another view of The Aria; in this image you can see the tram blur past on the tracks above the street. Looking west on a skywalk over Las Vegas Boulevard; the towers in blue are The Cosmopolitan. I photographed this street musician and his dog on the same skywalk that is in the previous images. This image by Abby shows traffic on Las Vegas Boulevard. I found this sculpture in City Center, Las Vegas. Lights on ceiling, Planet Hollywood, Las Vegas. This amazing fisheye view from our Las Vegas hotel room seems a fitting final image to a truly amazing, incredibly fun seventh anniversary vacation for my wonderful wife Abby and me. The Luxor Las Vegas Hotel shows its signature pyramid and light beam. Morning rainbow over Las Vegas; one presumes the “end of the rainbow” is a casino. Upon waking, I opened the terrace door to see and photograph a rainbow over the city. We tried the breakfast buffet here at The Cosmopolitan’s Wicked Spoon and found it every bit as amazing as you might expect. 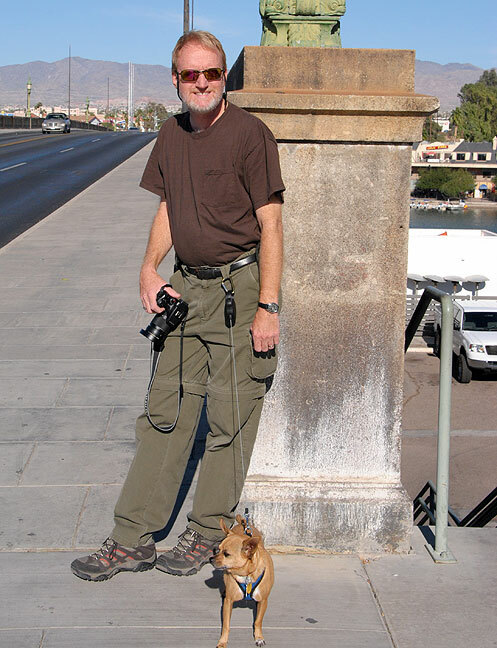 We put the dogs in their kennel cage and drove to Hoover Dam, where we took the longer of the two guided tours, the one that includes the interior of the dam. Except for strong winds stalling elevators a couple of times, it went without a hitch and was very fun. This is a fisheye view from the top of Hoover Dam looking south down the Colorado River, showing the newly-completed Mike O’Callaghan – Pat Tillman Memorial Bridge. This is me crossing the road at Hoover Dam. Access tunnel, Hoover Dam; at 6′ 1″ tall, I had to bend to walk through this passage. Abby and other members of our group visit the end of the access tunnel, which leads to the river side of the Hoover Dam. Stairway to Heaven? This locked staircase leads to the bottom of Hoover Dam. I don’t want to bore anyone with requisite shots of the generator room at Hoover Dam, so I shot this one with my fisheye lens. This is one of Abby’s images from the generator room at Hoover Dam. No Hoover Dam travelogue would be complete without this shot of the generators. I was impressed by how beautifully appointed and finished this access passage was at Hoover Dam. These towers hold power lines that carry Hoover Dam’s hydroelectric power to its destination. 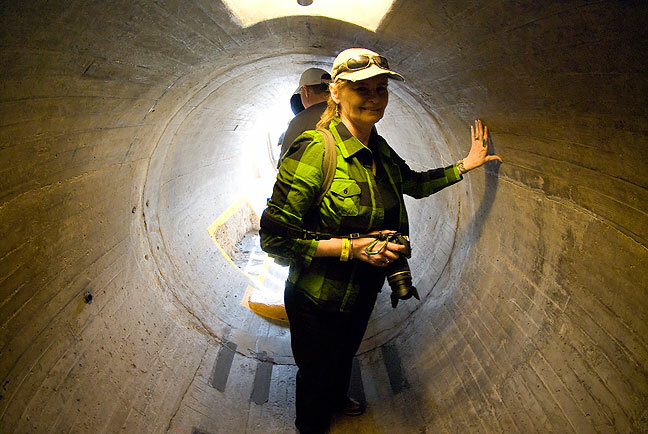 Abby smiles as she visits one of the access tunnels inside Hoover Dam. This tunnel leads from the main corridor to the exterior of the dam, where you can look out and see the river below. This Hoover Dam Visitor Center statue pays tribute to “The High Scaler,” the most dangerous job in constructing the dam. 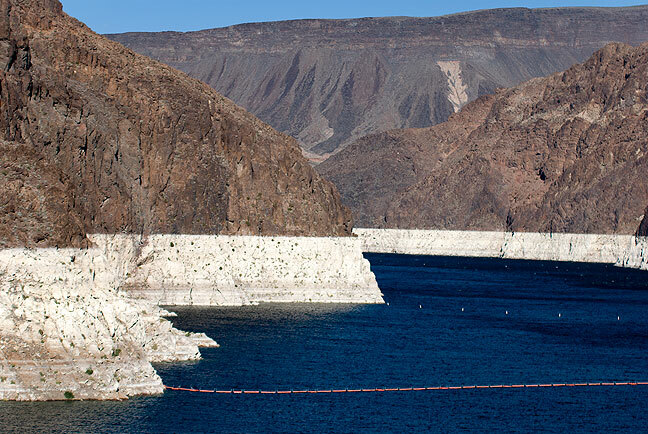 This view of Lake Mead upstream of Hoover Dam shows how drought has affected this reservoir. Abby and I stopped at a place in Boulder City that makes and sells iron sculpture, and while we would have come home with a trailer full of stuff, we settled for a braised iron Kokopelli. As night fell Abby and I had dinner at Scarpetta, the fourth of the Cosmopolitan’s 13 fine dining establishments we visited (the others being Blue Ribbon Sushi Bar, China Poblano, and The Wicked Spoon.) After dinner we ventured onto The Strip, where we walked and made some really nice images of her with the 35mm f/1.8 we got recently just for such low-light occasions. The weather was breezy and cool, and we both had a great time just being together. 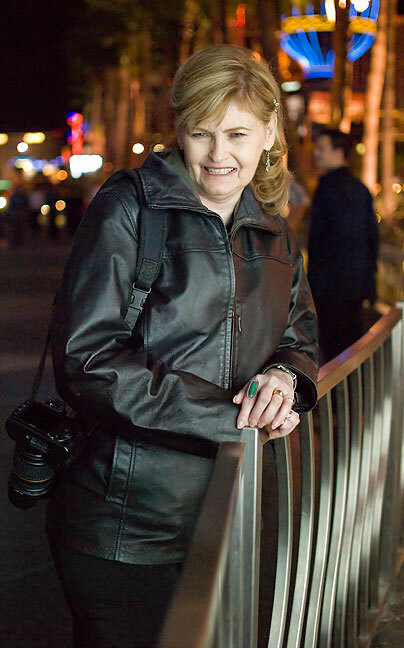 Abby smiles for me as we walk The Strip in Las Vegas. Abby works the scene on The Strip. Abby, the dogs, and I pose with a pink Cadillac belonging to Elvis “Eddie Powers” Presley at the Welcome to Fabulous Las Vegas sign as we were leaving town. Abby and I had pondered the notion of driving farther west to Death Valley, but the more we thought about it, the more we felt Death Valley was so huge that it deserved a vacation devoted just to it. Instead we headed south into the corner of California through Needles to Lake Havasu City, Arizona, home of London Bridge. On the way out of Las Vegas we photographed the traditional “Welcome to Las Vegas” sign and had our picture made with the Elvis who was there and his ’56 Cadillac. London Bridge was purchased and transported to Lake Havasu City, Arizona in 1971. Abby made this image of Max and me at the west end of London Bridge. 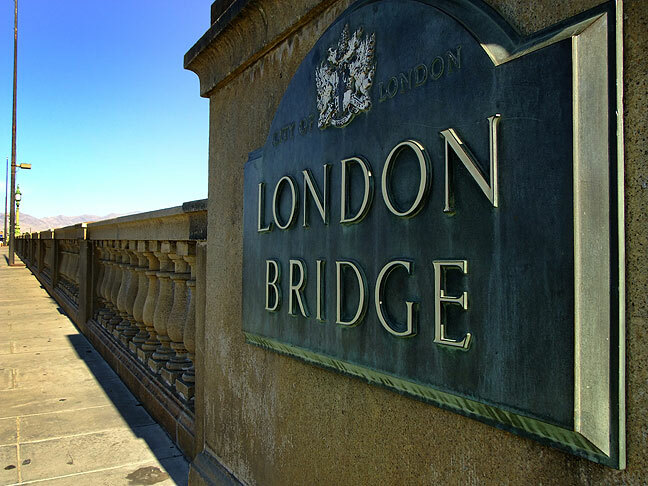 This sign and the lamps on Lake Havasu City’s London Bridge are original just like the bridge itself. Abby and Sierra descend the stairs at London Bridge. Also along our drive was a giant silver geodesic dome on a stick with an attached convienience store. The owner told us it was once his mother’s home, but they were in the process of making it into a museum attraction. Tons of fun, funny images. Also along Interstate 40 near the Arizona-New Mexico border was this well-weathered motel sign. 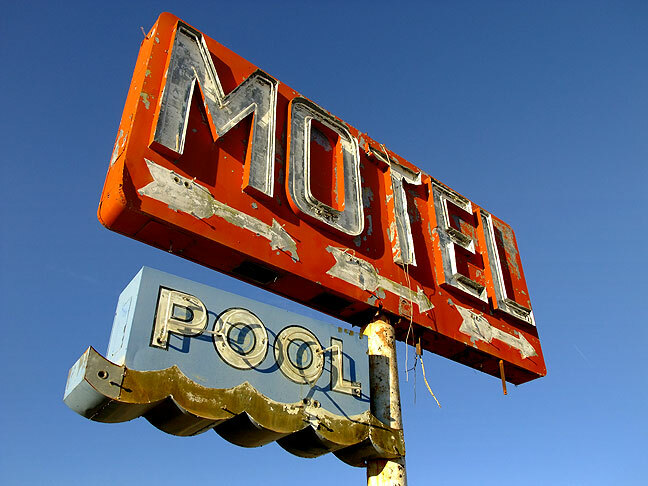 There was no sign, however, of any motel or pool to go with it. The large geodesic dome in this image was a residence at one time, but when we visited, it was in the process of becoming a museum. 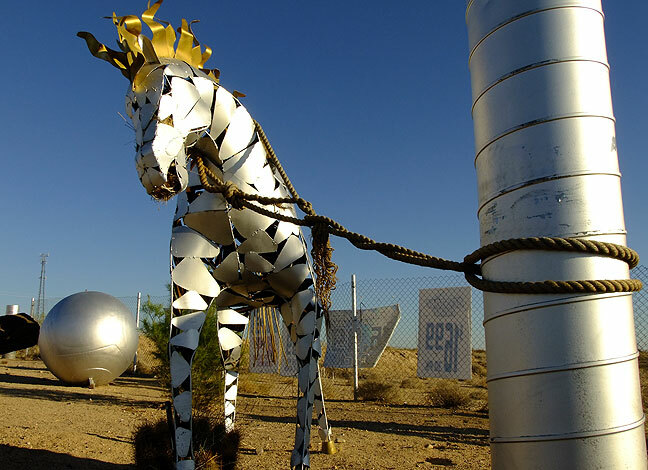 Everything around the dome house on a stick was painted silver, including this sculpted steel horse. 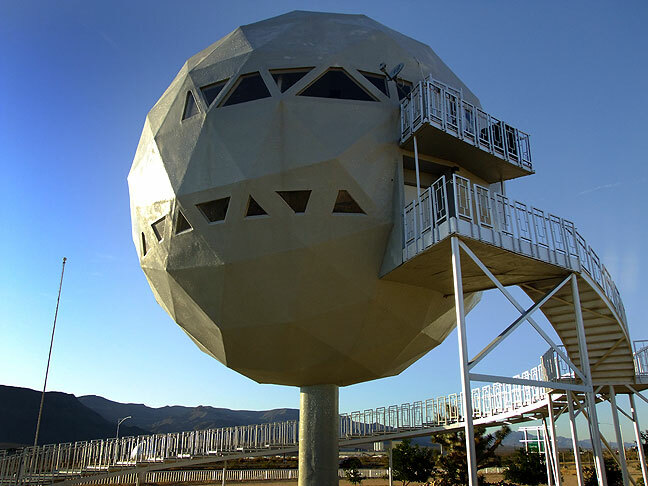 Of all the oddball roadside attractions we’ve stopped to photograph over the years, I think this one, a geodesic dome that was once a residence near Kingman, Arizona, might be the oddest. Abby and I pose with the dogs at the Sedona, Arizona, Airport, which offers a view of the entire Sedona area. Woke up in Flagstaff to the same spectacular sunshine we’ve enjoyed all week. We drove south on I-17 to the south end of the Sedona area and wound our way through the Red Rock Scenic Byway. Nice Visitor Center, nice scenery, but crowded, particularly with busses which disgorged dozens of oriental tourists. This lavish overview of Sedona is visible from the Chapel of the Holy Cross. The facade of the Chapel of the Holy Cross looks over the Sedona area. The best item we photographed in the area was its signature piece, Chapel of the Holy Cross. There were lots of tourists, but the coolest among them were three buddhist monks. The Chapel itself is built into a handsome red rock stone bluff, and is immaculate and beautiful, inside and out. It was a little weird, though, to be photographing the inside of a church where people were praying, but it was going on, so I joined in. We saw a handsome overlook at the top of the Sedona airport road, then drove a winding road to Red Rock Crossing State Park, where we made some nice images of waterwheels and reflections in Oak Creek. 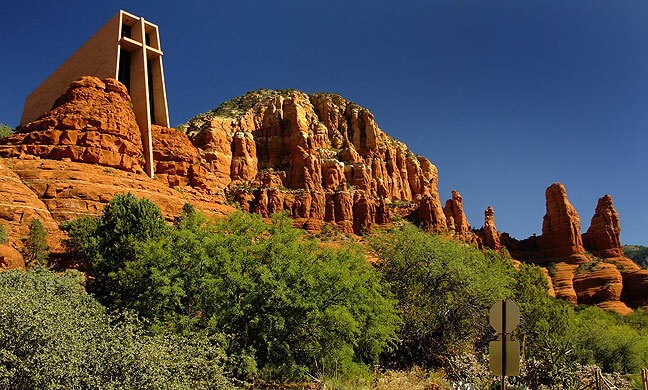 The Chapel of the Holy Cross sits in a cliff that overlooks Sedona, Arizona. Walking around Sedona to find the right angles, I am all about the images. We decided we definitely didn’t like driving in the Sedona area, which features dozens of roundabouts. Finally, we took 89a back to Flagstaff. 89a follows deep, winding canyons and features breathtaking views mingled with ranches, resorts and campgrounds. In Flagstaff we found a Quisnos, our favorite sub shop, and had a great lunch outdoors in the high Arizona sunshine. The Chapel of the Holy Cross is just as remarkable inside as it is outside. Small votive candles line the right hand wall of the Chapel. Taller candles, many lit, line the left side of the Chapel. Still more candles fill the Chapel of the Holy Cross, these near the entrance. Abby’s truck, a 2010 Nissan Frontier Crew Cab 4×4, averaged 20.4 miles per gallon over the entire trip. In our Las Vegas hotel, it was almost impossible to find coffee, even if we wanted to pay for it. Even on the street, there was plenty of alcohol, even in the morning, but almost nowhere to get coffee. Abby and I made more images than on any previous trip, more than 25GB of stills and video. Our dogs, Max and Sierra, spent most of their road time in the back seat on a fleece blanket. They were frequently admired in our Las Vegas Hotel. Abby and I did not gamble, though we did pay for some of the most expensive dinners we have ever enjoyed, and felt they were completely worth it. As we drove, out of the blue Abby suggested a name for our RV (which we didn’t bring on this trip). We’d been debating it’s name since we got it two Junes ago, and couldn’t agree. So as of today, our RV is named Kokopelli. 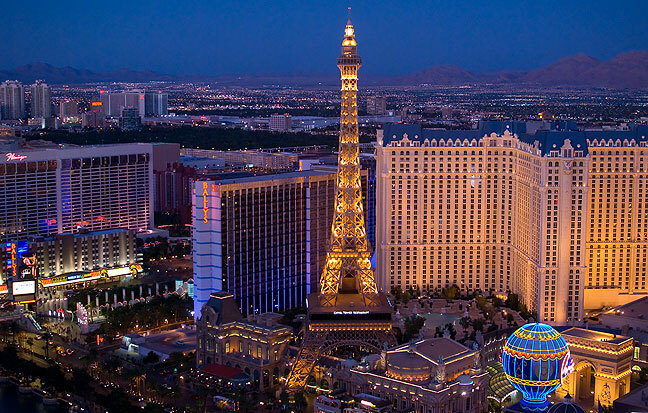 The half-scale Eiffel Tower of the Paris Las Vegas dominates this image looking northeast. Despite shooting hundreds of images, I feel like I could explore The Strip for days, weeks, or even months without getting bored or repeating myself. Strangely, Marline and I didn’t see any of this, though we’d been warned about it. We’ve had more people ask us for money in Killeen, Texas. One final note: I’m just a little pissed at your images of the Hoover Dam interior. We did not take any tours there because we were specifically told that photography would not be permitted inside the dam. (This was in 2009.) Ugh. I don’t know what else to tell you about it, except that maybe the Department of Homeland Security had upgraded the Threat Level when you were there from aqua to chartreuse.